Thank you for your mails for liking the patchwork coasters I sewed previously. Some of you asked how I did it. So I did a simple tutorial on this. 1. 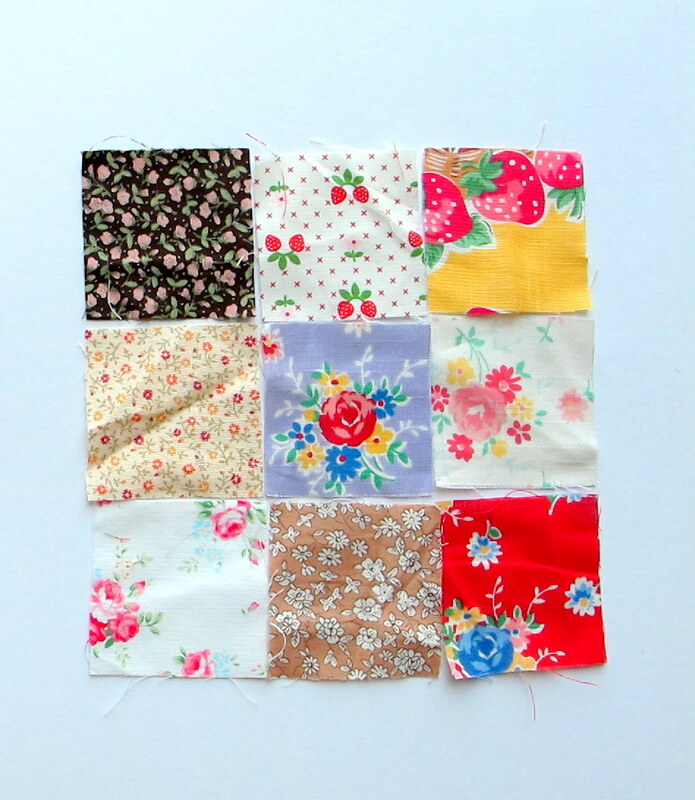 Cut nine squares from your chosen fabric. Any size is ok. I cut mine 2.5" x 2.5". Lay out your desired arrangement. 2. Sew the squares row by row. After which, sew the rows together. Remember to align and pin carefully. 3. Now you get a nine-squares patchwork block. Press the seams open. 4. Turn over and place your block on a batting. I usually cut my batting a little larger than my block since quilting may pull and shrink the batting. 5. Quilting time (means sewing the block onto the batting). You can choose to sew in any way you like. Cross, diagonal, free motion... so long as the block and batting are sewed together. Here, I use stitch-in-the-ditch method. 6. Next, use a round object to outline the shape of your coaster. the object can be of any size, depending on how big you want your coaster to be. I use a bowl which happen to fit just perfectly. 8. This step is optional. I added lace for my previous coasters for hanging purpose. For this coaster, I chose to use grosgrain instead. Cut 6 cm and fold into half and pin as in picture. 9. Place the backing and the block with RIGHT sides facing and pin. Sew 1 cm seam allowance around the coaster, leaving a 5 cm gap (between first and last stitch). The gap is for you to turn the coaster inside out. 10. Almost there...! Now snip around the coasters for easy turning out. Easy project right? Make for your family and friends as gifts, wedding favors, or just for your own home! Note: You may use this tutorial to make coasters to sell. But... please add a credit to zakkaArt! Thank you! 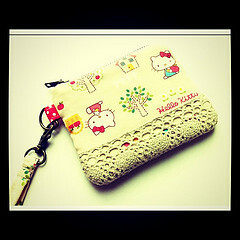 Here is the tutorial on zippered pouch. It's not difficult to make one. Perhaps some people have bad experience with sewing zippers on machine but it's actually relatively easy. Just a few practices and you will be breezing through sewing all kinds of zippers. *Note: Zipper is opened all the way to the end before pinning. *Note: Zipper is closed before pinning. *Note: Center folded is exterior back fabric. *Note: Bring the zipper head to halfway the zipper. This is to facilitate when you turn the pouch inside out. *Note: You can add grosgrain or lace at side of the pouch for attachments. I added a fabric tab. Now you can sew many zippered pouches (this tute applies for pouches of all sizes except measurements) for your loved ones, family and friends, especially now that Valentines' Day is approaching? Pls let me know if you have any questions by leaving me comments. I'll try my best to answer them! Last night, I popped by one of my favourite sites. It's by Anna Maria Horner and her hand quilting tutorial. Her tutorial amazes me as I do quilting in a rather different way. So here I am, sharing my version of hand quilting method (since I'm in the progress of quilting babyY's quilt too). First, you need a good quality quilting thread and a quilting needle. I use a really small quilting needle from Clover since that's what I only have. Some people use embroidery thread and needle. It's fine too. Cut your batting slightly bigger than your quilt top as the batting will sort-of "shrink" during quilting. Lay the quilt top on top of the batting on the floor and secure the two layers with safety pins. NOTE: I choose to omit the backing for quilting because I do not want my stitches to show at the back. And also to save trouble of making sure my stitches are even at front and back. Always start quilting from the centre so that you can still manage the creases made upon quilting. I like to put safety pins around the area which I'll quilt. I do not have a quilting hoop or frame since I don't think I need one anyway. Start with a back-stitch with your knot at the backing (see here on how to do a quilter's knot). Then, create as many stitches as you can without pulling the needle out. I usually make 5-7 stitches at a go. It will be good if you have a thimble to help you push the needle through the thick layers. I wear a metal thimble (for short needles) on my middle finger. This is how your stitches will look like when you pull the needle out. Make sure your stitches are almost the same length and even (maybe less than 0.5cm per stitch). You can make a back-stitch after every 5-7 stitches. I'm lazy so I make one at about 10-12 stitches. A gap is created to make space for a back-stitch. Continue stitching and end with a back-stitch. And yeah, now you finish quilting a section and slowly, finish quilting the blanket.